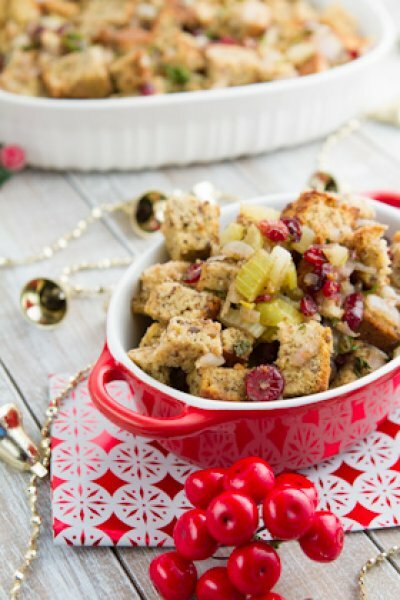 A gluten-free, dairy-free, paleo stuffing recipe that’s perfect for the holidays. 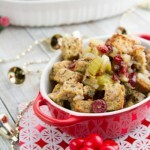 Made up of homemade flax bread, cranberries, apple juice and a hint of ginger, it’ll surprise you in all the right ways! Roughly chop fresh-baked bread into 1 inch chunks (it doesn’t have to be perfect). Place the pieces on a large baking sheet and place in the oven (do not turn it on!). Keep it there for 24 hours. If it’s still moist, let it sit in a 170F oven for about 20 minutes or so. The bread should be a bit more moist than croutons, but not soft. This step will help the bread retain its shape in the stuffing, so don’t skip it! Place the bread chunks in a large bowl and set aside. Preheat oven to 350F and lightly grease a 2.3 L/2.5 qt. casserole dish with a dab of coconut or olive oil. Combine apple juice and dried cranberries in a small bowl. Set aside. Heat olive oil in a large pan on medium-high heat. Add onion, celery and garlic and cook until soft, about 7 minutes. Add remaining ingredients, parsley, thyme, sage, pepper, salt, ginger and cinnamon, and stir to combine. Add vegetable mixture to bread and toss to combine being sure not to over mix. Now, pour the apple juice and cranberry mixture over top. Again, be sure not to over mix, just toss, then add to the prepared casserole dish. Cover and bake in preheated oven for 35 minutes. You could also use store bought gluten-free bread if you’re not concerned with grains and want to make this recipe vegan. You’ll need about 6 cups of cubed bread for the recipe. I have not tried to replace the eggs in this recipe with flax eggs or egg replacer. I would imagine that it wouldn’t work, but if you give it a shot, let me know!